Wedding Specials: If you are having your wedding at the Cambridge Yacht Club, we have special packages available. We're just down the street! Blackwater Paddle and Pedal also has bikes, kayaks, and canoes to rent. They will plan a tour of an hour or an all day excursion for you. Contact them at www.blackwaterpaddleandpedal.com. Special Tours Bay Tours, Fishing Parties, Lighthouse Tours, and Crab Feasts. Whichever is your pleasure, Sawyers’ Charters, south of Cambridge on Hoopers Island, will make it a memorable event for you and friends. Contact them at www.sawyerscharters.com. Whatever your pleasure, your hosts are happy to help with dinner reservations, charters, rentals or tours, and shop information. 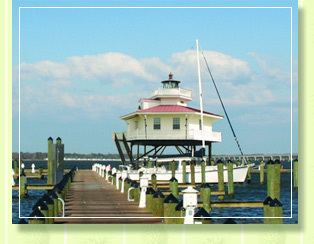 Established in 1684, Cambridge is the county seat for Dorchester County. It is the home to six Maryland governors, and a walking tour of the historic district will take you past some of their beautiful homes on both High Street and Mill Street. A short stroll will take visitors to the marina and gorgeous water views of Long Wharf, to dinner at a waterfront restaurant, or to one of the charming galleries or boutiques in town. Explore the nearby Blackwater National Wildlife Refuge, home to the largest population of bald eagles on the East Coast outside of Florida. Bikers welcome the many miles of easy riding in Dorchester County, the Heart of Chesapeake Country. You may borrow our bikes, or if you prefer, rentals are available. Follow the Tubman Trail, and revisit the stops where Harriet Tubman helped so many slaves escape to freedom. The Choptank, with its many coves and tributaries provides paddlers with miles of unspoiled waterways from which to enjoy beautiful scenery. 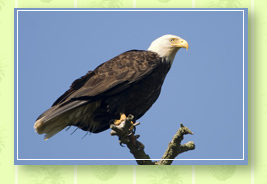 Depending upon the season, you will probably encounter eagles or osprey along the way. Take a lighthouse tour of the Bay, a river cruise on one of two paddle wheelers, or enjoy an afternoon sail on the Nathan, one of the few skipjacks remaining on the Bay. Antique lovers will find everything from fine furniture to whimsical collectibles at the many shops in town or in nearby Easton or St. Michael’s. To find more information on local attractions and events, visit the Cambridge Main Street, Dorchester County Tourism and Talbot County Tourism websites.